After a long pause I’m back again to discuss on Power BI. In my previous Power BI Series first part [link] I discussed about the first component of Power BI, i.e. 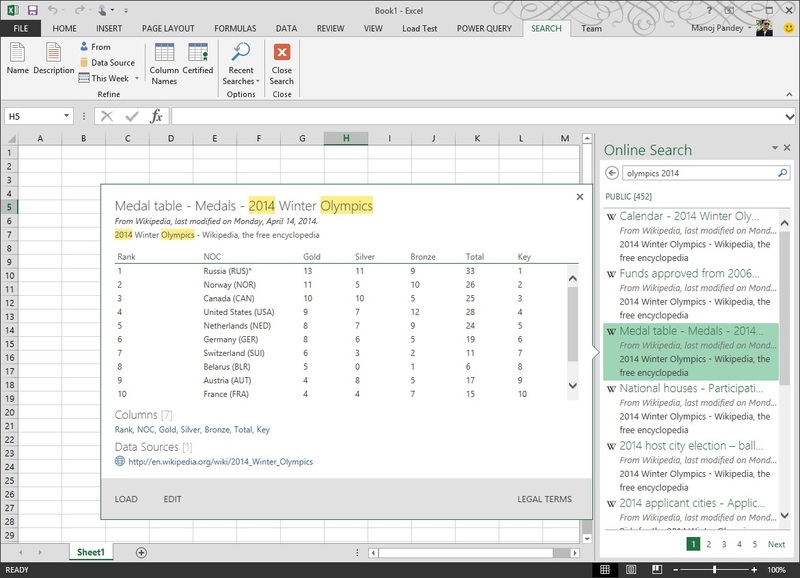 Power Query and how to use it to discover and gather data. 1. 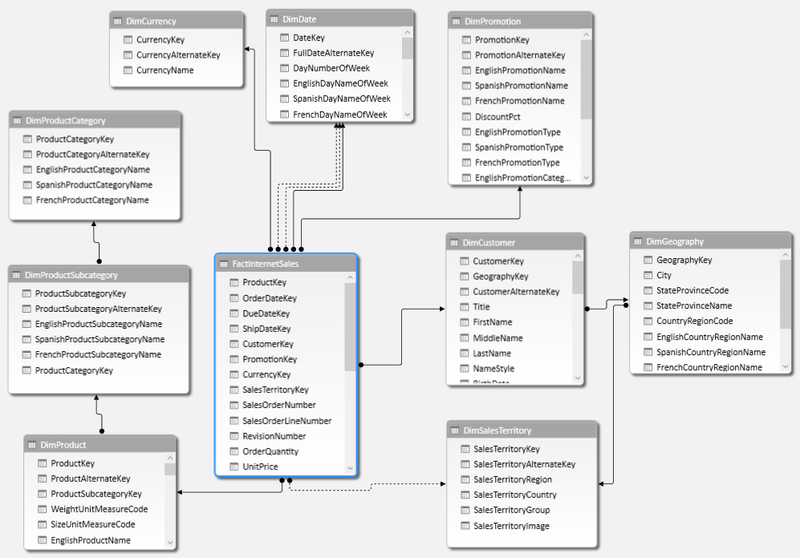 Create your own Data Model from various Data Sources, Modeled and Structured to fit your business needs. 2. Refresh from its Original sources as often as you want. 3. Format and filter your Data, create Calculated fields, define Key Performance Indicators (KPIs) to use in PivotTables and create User-Defined hierarchies to use throughout a workbook. And here in second part I will discuss about few of these features. –> The benefit of creating Data Model in Power Pivot is that Power Pivot Models run in-memory so that users can analyze 100’s of millions of rows of data with lightning fast performance. 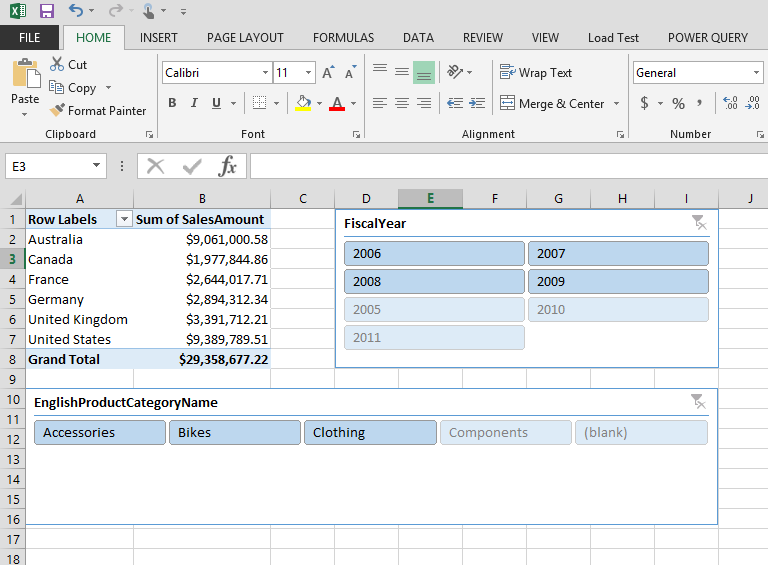 All you need is Microsoft Excel 2013 to create your Data Model. 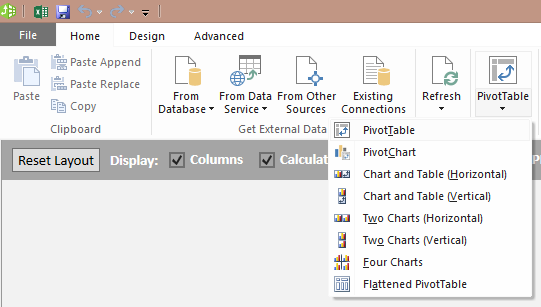 Check this [link] to troubleshoot if you don’t see POWERPIVOT option in Excel ribbon. 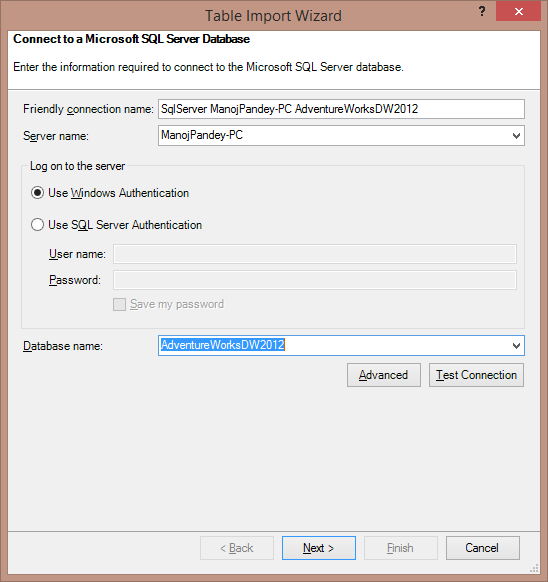 To create a Data Model you need a Data Source, so we will use SQL Server as a Data Source and I’ve setup AdventureWorksDW2012 Database for our hands-on. Click [here] to download AdventureWorksDW2012 DB from CodePlex. 1. Open Excel, and go to POWERPIVOT tab and click on Manage, this will open a new PowerPivot Manager window. 2. Now on this new window, click on From Database icon and select From SQL Server from the dropdown, this will open a Table Import Wizard Popup window. 3. Provide SQL Server Instance name that you want to connect to. 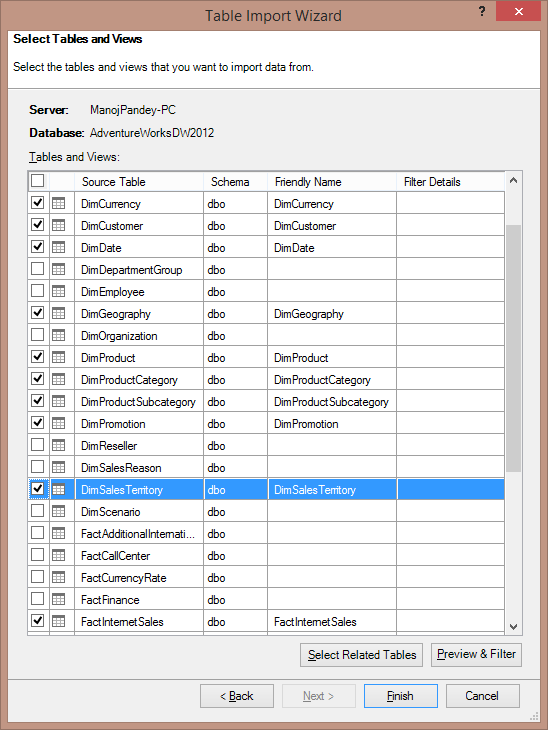 Select AdventureWorksDW2012 Database from the Database name dropdown, and click Next. 4. Click Next again and select the required Tables (10 selected), click Finish. 5. Make sure you get Success message finally, click Close. 1. Go to the PowerPivot Manager window and click on PivotTable icon and then select PivotTable from the dropdown. 2. 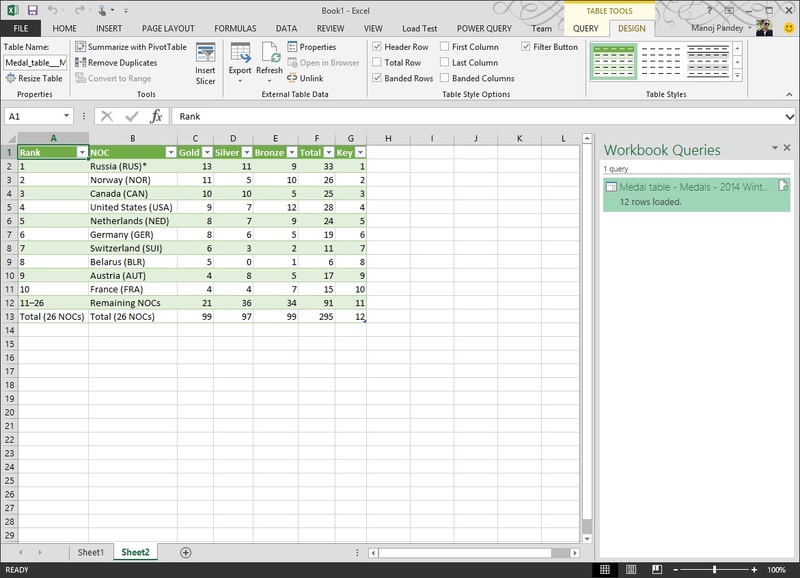 The control moves to the Excel sheet, select Existing Worksheet on the Popup. 4.a. Click on PIVOTTABLE TOOLS – ANALYZE, here click on Insert Slicer. On ALL tab, select DimDate.FiscalYear column. This will add Year slicer to the report. 4.b. Now again click on the PivotTable Report, you will see the PIVOTTABLE TOOLS on the ribbon bar again. Select Insert Slicer again and select DimProductCategory.EnglighProductCategoryName column. This way you can add Graphs, Charts and create very impressive Reports UI as per your requirements. This Power Pivot – Data Model can also be used to create Power View Reports, which we will cover in next part of this series. In my previous posts I discussed about Power BI [link], what is it, its components, features and capabilities in the new world of Self Service IB. Self Service BI allows end users to design & deploy their own reports, analyse within an approved & supported architecture and tools portfolios. End users do not have to worry about maintaining databases, doing integrations, creating warehouses/marts, reports, etc. The Self Service BI tool provide features which are capable enough to do all these activities in an automated, quick and efficient way, and all you have to do is learn how to configure these tools. Power BI is one such tool offered by Microsoft, you can read about it my previous posts, [link] and Microsoft Official blog, [link]. –> Let’s see a small demo how you can use Power Query: All you need is Excel and Power Query add-In, which you can download from Microsoft official site, [link]. Go to Ribbon, click “Table Tools” -> Query -> Edit, this will open the “Query Editor” window where you can edit, clean the data. 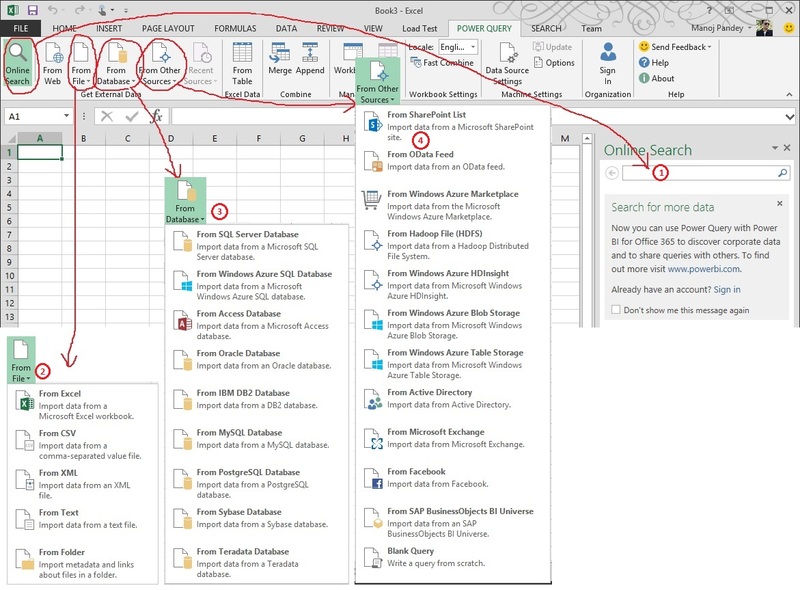 You can even Create Queries that you can save and use again later to refresh your data. Merge different tables in one step; rename, delete or even create fields. 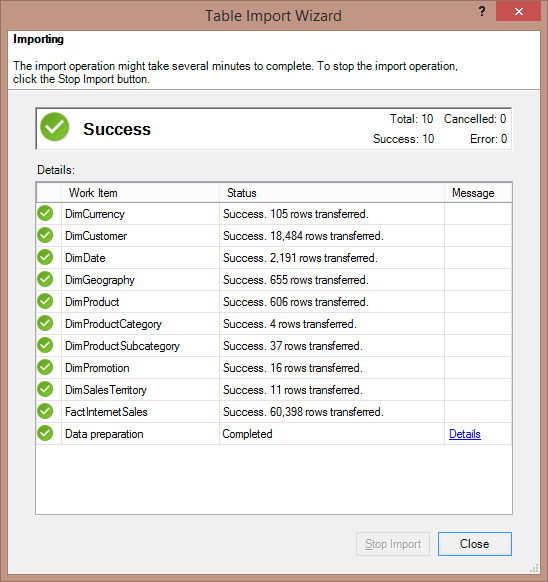 Transform your data before even importing it into a spreadsheet. 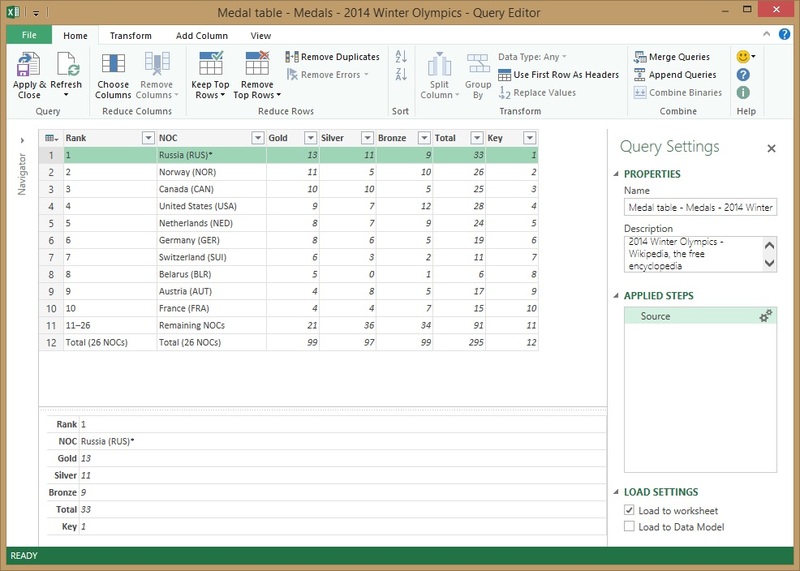 This way you can get your data ‘analysis ready’ with Power Query !! !